Aside from her gorgeous blonde hair and southern heritage, Payton Rae knows how to record a catchy country song – the latest teen internet sensation has released her debut album DARE TO LIVE and is available to download on iTunes. The up and coming country star looks great posing next to the Black and Pink Ford Mustang GT she calls her “Pink Pony” – check out that plate too. 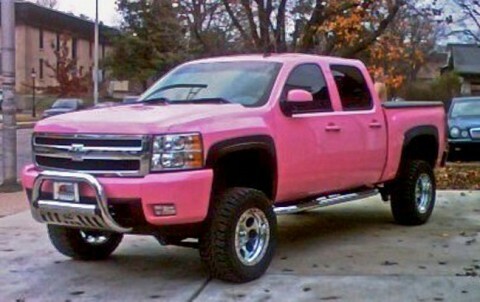 This Chevy Silverado was given to pop country singer, Taylor Swift, as a gift for her 18th birthday. The car was given to her from Big Machine Records. It was a nice idea, but it wasn’t executed well. Just because she is a girl does not mean she wants a pink car and just because she is a country singer does not mean she wants a truck. It looks like a cheap bubble gum pink paint job on the car and not much more customization. I would have loved to see all the chrome trim and grille on the car to be black. Not very impressed with this car. I think that Taylor felt the same way. She ended up donating the truck to the Victory Junction Gang Camp.